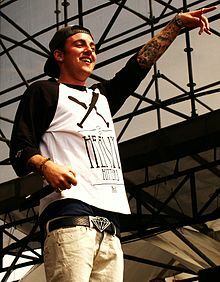 Malcolm James McCormick (born January 19, 1992), best known by his stage name Mac Miller, is an American rapper. He is also a noted record producer under the pseudonym Larry Fisherman. Miller is also known for taking on multiple alter-egos, under the aliases Delusional Thomas, Larry Lovestein and The Velvet Revival. Malcolm James McCormick was born on January 19, 1992, in Pittsburgh, Pennsylvania, the son of Karen Meyers, a photographer, and Mark McCormick, an architect. His father is Christian, and his mother is Jewish; Miller was raised Jewish and had a Bar Mitzvah. He was raised in the Point Breeze part of Pittsburgh. Miller attended Winchester Thurston School and Taylor Allderdice High School. In high school, Miller decided to focus on his hip hop career, later noting, "Once I hit 15, I got real serious about it and it changed my life completely ... I used to be into sports, play all the sports, go to all the high school parties. But once I found out hip-hop is almost like a job, that's all I did." Miller, a self-taught musician, plays piano, guitar, drums, and bass. Miller first started rapping at the age of fourteen. Before that, he wanted to be a singer. Prior to changing his name to Mac Miller, he was known as EZ Mac and released the mixtape But My Mackin' Ain't Easy in 2007 at the age of fifteen. Miller was also part of rap group The Ill Spoken together with fellow Pittsburgh rapper, Beedie. The Ill Spoken released the mixtape How High in 2008. In 2009 Mac Miller released two mixtapes The Jukebox: Prelude to Class Clown and The High Life before getting signed to Rostrum Records. In 2009 at age 17, he made it to the final four in Rhyme Calisthenics, the MC competition at Shadow Lounge. In early 2010, Miller signed with Rostrum Records. Rostrum president Benjy Grinberg met Miller while recording with Wiz Khalifa at ID Labs. Although Grinberg started giving Miller advice, he didn't show any interest in getting involved with his career until the artist began work on the K.I.D.S. mixtape, when, as he later told HitQuarters, Grinberg "noticed a maturation in his sound and approach to his music." By that point Miller had started attracting interest from different record companies but chose Rostrum due to its location in his hometown and association with Wiz Khalifa. K.I.D.S. was released by the label in August 2010. The mixtape was inspired by the movie Kids. A significant breakthrough came in late 2010 when Miller embarked on his first tour, the Incredibly Dope Tour, selling out every location. In 2010, he won two awards at the Pittsburgh hip hop awards. Miller's fifth release was the mixtape, Best Day Ever featuring the single "Donald Trump" and hit songs "Wear My Hat" and "All Around The World". The mixtape featured mainstream producers such as Just Blaze, 9th Wonder, and Chuck Inglish of The Cool Kids. On November 22, 2010 his first single "Knock Knock" premiered its video on YouTube. On March 29, 2011, he released an EP called On And On And Beyond. The six-track work was produced by Rostrum Records. On July 5, 2011, Miller announced the title of his first album Blue Slide Park on his YouTube channel, set for a Fall release. In September 2011 it was revealed that Miller would release a mixtape titled 92 Til Infinity hosted by DJ Jazzy Jeff prior to the release of Blue Slide Park. However, the release did not happen, and it was since then left in planning. Miller featured on Maroon 5's remix of their hit song "Moves Like Jagger". On October 14, 2011, Mac Miller released a 13 song mixtape called I Love Life, Thank You, featuring Sir Michael Rocks of The Cool Kids, Talib Kweli, and Bun B. On November 2011, Blue Slide Park debuted at number 1 on the Billboard 200 with first week sales of 144,000 copies. This was the first independently distributed debut to take the number one spot on the Billboard albums chart since Tha Dogg Pound’s 1995 release Dogg Food. In 2011 Miller was one of eleven rappers featured in XXL magazine's Freshman Class of 2011. In 2011, his first TV appearance took place in the VH1 show Single Ladies; he played a fictionalized version of himself that succeeded in selling one of his mixtapes to one of the main characters. Also in 2011, he was a part of MTV Jams Fab Five artists. On February 15, 2012, Mac Miller uploaded a trailer on YouTube for his long anticipated music video "Missed Calls". It was released on his official YouTube channel on June 22, 2012. On March 23, 2012, Mac Miller released his seventh mixtape called Macadelic. He released "Loud" as a single from the mixtape. "Loud" peaked at number 53 on the US Billboard Hot 100 chart. Miller also released a video for "Thoughts From A Balcony". In June 2012 Mac Miller premiered the song "Onaroll" available on YouTube. "Onaroll" is performed by Mac Miller and produced by Pharrell Williams, from a future collaboration EP titled Pink Slime. On August 7, 2012 Miller released a further single from "Pink Slime", "Glow", available for free download. On September 1, Miller released another free song called "PlaneCarBoat" which features West Coast rapper Schoolboy Q and was produced by himself. On November 21, 2012, Miller released an iTunes exclusive EP entitled You under the name Larry Lovestein & The Velvet Revival. Rather than rap, the EP features Miller crooning over lounging jazz instrumentals. On October 14, Miller announced Pink Slime would be released before the end of 2012 and that his second album, Watching Movies with the Sound Off, will be released in early 2013. Watching Movies With the Sound Off is set to feature guest appearances from Schoolboy Q, Ab-Soul, Earl Sweatshirt, Tyler, the Creator, Action Bronson and Jay Electronica. When speaking of the album Miller said that it is "very introspective and very personal so it’s kind of throwing it all out there and seeing what happens." He also announced his plans to finally release 92 Til Infinity with DJ Jazzy Jeff in early 2013 prior to his release. Mac Miller is currently featured on a six-episode reality series titled Mac Miller and the Most Dope Family on MTV2. It features the production of Watching Movies With the Sounds Off and premiered on February 26, 2013. The first trailer was released on January 20, 2013. On March 4, 2013, Miller released a new mixtape solely featuring instrumentals made by Miller titled, Run-On Sentences Vol. 1 under his production alias "Larry Fisherman". On March 9, he would announce the first single from Watching Movies with the Sound Off to be "Somebody Do Somethin'" and to release soon. He premiered a snippet of the song of the second episode of his reality show. On May 2, 2013, he announced via UStream and Twitter that Watching Movies with the Sound Off would be released on, June 18, 2013. The album was met with generally positive reviews upon its release, with most critics praising his new psychedelic sound. The album also received commercial success debuting at number three on the Billboard 200 chart, selling 101,000 copies in its first week. The album spawned three singles; "S.D.S. ", "Watching Movies" and "Goosebumpz". Mac Miller founded REMember Music, his own record label imprint in early 2013, named after a friend who died. He also fully produced Odd Future affiliate Vince Staples' mixtape, Stolen Youth. During October 2013, Miller toured Europe with fellow rappers Lil Wayne and 2 Chainz. On October 31, 2013, Mac Miller released a new self-produced mixtape named Delusional Thomas. On December 17, 2013, Miller released his first live album, Live from Space. Following that, he plans to begin working with Pharrell again on their collaboration EP Pink Slime to be released during 2014. He is also currently working on four separate projects, that he already has at least seven songs done on each. He told MTV that they include his next solo "Mac Miller album," and it had come together by accident. On January 14, 2014, Mac Miller announced he was no longer signed to Rostrum Records. On May 11, 2014, Miller independently released his tenth solo mixtape, Faces. On October 21, 2014, it was revealed Miller signed a recording contract and a distribution deal for his label REMember Music, with Warner Bros. Records, for a reported $10 million. On July 30, 2015, Miller revealed that he had completed his third studio album, which will be his major label debut. On August 5, 2015, Mac Miller revealed his album title to be GO:OD AM with a release date of September 18, 2015, and that a music video for the first single "100 Grandkids" would drop August 6. On July 28, 2016, Mac Miller announced his fourth album, The Divine Feminine, and debuted its first single, "Dang! ", featuring guest vocals from Anderson .Paak. The album was released on September 16, 2016. Mac Miller includes Big L, Lauryn Hill, the Beastie Boys, Outkast, and A Tribe Called Quest among his influences. He also has a close relationship with fellow Pittsburgh rapper Wiz Khalifa, saying "Wiz has been a big brother to me with this music thing so far. Our relationship is beyond music. He really is just my homie, whether I will be making music or not." Miller has said that he became addicted to a combination of promethazine and codeine known as "purple drank" or "lean" which he began taking to manage the stress he was enduring during his Macadelic Tour in 2012. In January 2013, Miller told Complex: "I love lean; it’s great. I was not happy and I was on lean very heavy. I was so fucked up all the time it was bad. My friends couldn’t even look at me the same. I was lost." At the time of Miller's addiction, his childhood friend, Jimmy Murton, said: "I saw him in that mentality I remember being in—you’re getting fucked up because you feel like you need to. You’re trying to get away from everything. For how much he was drinking, it’s unbelievable that he stopped. It’s definitely one of the most impressive things he’s ever done." Miller quit taking promethazine in November 2012, before he started the shooting of his reality show, Mac Miller and the Most Dope Family. Miller was in a long term relationship with a woman he met in middle school for four years until April 2013. Many of the songs on his mixtape Macadelic were about their relationship. In August 2016 TMZ reported that Miller was dating Ariana Grande, which Grande subsequently confirmed in a September 6 Instagram post. On July 9, 2012, producer Lord Finesse filed a $10 million lawsuit against Mac Miller, Rostrum Records and DatPiff for the use of a sample of Finesse's song "Hip 2 Da Game" used in Miller's 2010 mixtape song "Kool-Aid and Frozen Pizza." In January 2013, the lawsuit was settled out of court with its stipulations kept confidential. ^ a b c d e Todd, Deborah M. (August 12, 2010). "Like Wiz Khalifa, rapper Mac Miller is another talent from Allderdice". Pittsburgh Post-Gazette. Retrieved February 23, 2011. ^ "Mac Miller: From blue slide to Billboard — Pittsburgh Post-Gazette — Printer friendly". Post-gazette.com. November 8, 2011. Retrieved February 19, 2013. ^ "J Magazine issue 2". Issuu.com. March 10, 2011. Retrieved February 19, 2013. ^ Phillips, Rashad (March 9, 2011). "Mac Miller Talks Jewish Heritage". HipHop DX. Retrieved November 24, 2011. ^ Tobias, Jonathan (November 4, 2010). "DXnext: Mac Miller | Check Out New Hip Hop Artists & Upcoming Rappers". HipHop DX. Retrieved 2011-11-24. ^ "Mac Miller – Exclusive Interview with Rap Star". Shalomlife.com. March 7, 2011. Retrieved April 14, 2011. ^ "Mac Miller attack – Music". Toronto.com. Retrieved November 24, 2011. ^ Assad, David (June 7, 2007). "PG East: Winchester Thurston is Division 2 lacrosse champion". Pittsburgh Post-Gazette. ^ a b "Mac Miller". Rostrum Records. Retrieved May 22, 2011. ^ Ahmed, Insanul (January 29, 2013). "He Started Rapping When He Was 14". complex.com. Complex Media. Retrieved January 30, 2013. ^ Ahmed, Insanul (January 29, 2013). "He Tried to Be a Singer/Songwriter Before Becoming a Rapper". complex.com. Complex Media. Retrieved January 30, 2013. ^ "Allderdice grad Mac Miller garners national attention with his latest mixtape – Music – Music Features – Pittsburgh City Paper". Pittsburgh City Paper. March 31, 2011. Retrieved November 24, 2011. ^ "PRESS RELEASE: Mac Miller Signs to Rostrum Records – – Are You In That Mood Yet ?". Areyouinthatmoodyet.com. July 21, 2010. Retrieved November 24, 2011. ^ a b c d "Interview With Benjy Grinberg". HitQuarters. October 17, 2011. Retrieved October 19, 2011. ^ Mervis, Scott (March 31, 2011). "How Wiz Khalifa, Mac Miller and Girl Talk became the new face of the music scene". Post-gazette.com. Retrieved November 24, 2011. ^ "Mac Miller – Knock Knock". Youtube. Retrieved July 5, 2011. ^ Miller, Mac. "Mac Miller – Album Title Announcement". Youtube. Retrieved July 5, 2011. ^ "Mac Miller To Release "Blue Slide Park" On November 8TH + Album Art". MacMiller.org. Retrieved September 17, 2011. ^ "Mac Miller to Appear on Maroon 5′s "Moves Like Jagger (Remix)"". Xxlmag.Com. September 14, 2011. Retrieved November 24, 2011. ^ Jacobs, Allen (November 16, 2011). "Hip Hop Album Sales: The Week Ending 11/13/2011". HipHop DX. Retrieved November 24, 2011. ^ a b c Ahmed, Insanul (January 28, 2013). "Mac Miller: King of the Hill (2013 Online Cover Story)". complex.com. Complex Media. Retrieved January 30, 2013. ^ "XXL Freshmen 2011 | Mac Miller". Xxlmag.Com. May 25, 2009. Retrieved November 24, 2011. ^ "Mac Miller Appearance On "Single Ladies" | Mac Miller Fan Site". Macmiller.org. June 13, 2011. Retrieved November 24, 2011. ^ "Mac Miller – Missed Calls (Trailer)". YouTube. February 15, 2012. Retrieved December 19, 2014. ^ "Mac Miller – Missed Calls (Prod. By Ritz Reynolds)". YouTube. June 22, 2012. Retrieved August 7, 2012. ^ "Mac Miller - Chart history". Billboard. Retrieved 2015-11-01. ^ YouTube – "Mac Miller Moves Out of Mom's House — Bamboozle Festival 2012"
^ YouTube – "Mac Miller x Pharrell — Onaroll (Audio)"
^ "Listen Up: "PlaneCarBoat" By Mac Miller Feat. ScHoolboy Q". Ology. Retrieved September 6, 2012. ^ "iTunes – Music – You – EP by Larry Lovestein & The Velvet Revival". Itunes.apple.com. November 21, 2012. Retrieved June 25, 2013. ^ "Mac Miller Says "TDE Will Be A Big Part" Of Next Album, Talks Bond With ScHoolboy Q, Ab-Soul & Cam'ron". Retrieved November 2, 2012. ^ "Mac Miller: King of the Hill (2013 Online Cover Story)". Complex. Retrieved February 19, 2013. ^ "Interview: Mac Miller Speaks On Winning Complex's Man Of Next Year". Complex. Retrieved February 19, 2013. ^ "Mac Miller & DJ Jazzy Jeff To Release "'92 Til Infinity" In Early 2013". HipHopDX. Cheri Media Group. November 26, 2012. Retrieved November 26, 2012. ^ Horowitz, Steven J. (January 20, 2013). "Mac Miller & MTV2's "Mac Miller And The Most Dope Family" Reality Show Trailer". HipHop DX. Retrieved February 19, 2013. ^ HipHopDX (March 4, 2013). "Mac Miller "Run-On Sentences: Vol. 1" Mixtape Stream & Download". HipHopDX. Retrieved March 9, 2015. ^ Daniel Isenberg. "Mac Miller Announces First Single Off His Next Album". Complex. Retrieved March 9, 2015. ^ Miller, Mac (May 2, 2013). "Twitter / MacMiller: Watching Movies With The Sound". Twitter.com. Retrieved June 25, 2013. ^ Paine, Jake (June 26, 2013). "Hip Hop Album Sales: The Week Ending 6/23/2013 | Get The Latest Hip Hop News, Rap News & Hip Hop Album Sales". HipHopDX. Retrieved August 25, 2013. ^ Ahmed, Insanul (January 29, 2013). "He's Starting His Own Label, REMember Music". complex.com. Complex Media. Retrieved January 30, 2013. ^ Ahmed, Insanul (January 29, 2013). "He's Producing an EP for Vince Staples". complex.com. Complex Media. Retrieved January 30, 2013. ^ HipHopDX (March 5, 2013). "Lil Wayne Postpones European Tour". HipHopDX. Retrieved March 9, 2015. ^ "Mac Miller - Delusional Thomas". DatPiff. Retrieved March 9, 2015. ^ HipHopDX (January 3, 2014). "Mac Miller Says He's Working On Four Albums". HipHopDX. Retrieved March 9, 2015. ^ Rys, Dan (January 14, 2014). "Mac Miller Leaves Rostrum Records". XXL Magazine. Retrieved October 18, 2014. ^ Kramer, Kyle (January 14, 2014). "Mac Miller Announces He's Leaving Rostrum Records". Complex Magazine. Retrieved October 21, 2014. ^ Breihan, Tom (May 12, 2014). "Download Mac Miller Faces Mixtape". Sterogum.com. Retrieved October 22, 2014. ^ Zeichner, Naomi (October 21, 2014). "Exclusive: Mac Miller Signs His Label To Warner Bros Records". The Fader. Retrieved October 21, 2014. ^ "Mac Miller's 3rd Studio Album Is Done". Hotnewhiphop.com. Retrieved 2015-11-01. ^ "Mac Miller Announces New Album Title & Release Date". Hotnewhiphop.com. Retrieved 2015-11-01. ^ Morris, Jessie (July 28, 2016). "Mac Miller Announces 'The Divine Feminine' Album and Shares New Song "DANG!" f/ Anderson .Paak". Complex. Retrieved July 28, 2016. ^ Strauss, Matthew (July 28, 2016). "Mac Miller Announces New Album The Divine Feminine, Shares New Track Featuring Anderson .Paak". Pitchfork. Retrieved July 28, 2016. ^ Tobias, Jonathan. "DXnext: Mac Miller". HipHopDX, Cheri Media Group. Retrieved May 22, 2011. ^ "Interview: Mac Miller « The FADER". Thefader.com. June 5, 2013. Retrieved June 25, 2013. ^ Garcia, Patricia (September 27, 2016). "Mac Miller on Love, Ariana Grande, and the Last Thing That Made Him Cry". Vogue. ^ Grande, Ariana (September 6, 2016). "baabyyyy". Instagram. ^ Avila, Theresa (September 7, 2016). "Ariana Grande Confirms Her Relationship With Mac Miller by Literally Wrapping Her Legs Around Him". New York. ^ Ahmed, Insanul (November 29, 2011). "Interview: The Night Mac Miller Spent In Jail". complex.com. Complex Media. Retrieved January 30, 2013. ^ Horowitz, Steven J (13 July 2012). "For Promotional Use Only?". Billboard. Retrieved 19 February 2016. ^ "6. Lord Finesse Sues Mac Miller for Using His Beat on a Mixtape — The 25 Biggest Hip-Hop Fails of 2012". Complex. Retrieved February 19, 2013. ^ Kaufman, Gil (January 16, 2013). "Mac Miller Settles $10 Million Lord Finesse Lawsuit — Music, Celebrity, Artist News". MTV.com. Retrieved February 19, 2013.